The hot water heater in your home is an essential component of your entire way of life. Without the modern invention of hot water heaters, we would still be boiling water over coals to take showers comfortably and clean our clothes. However, our hot water heaters are not impervious to the stresses and demands of modern life. They are just machines after all. Because we, as homeowners, rely on our hot water heaters on a daily basis, it is important to know some of the basics, so that you can remedy issues when they arise. Here are five water heater troubleshooting and repair tips. 1. Always turn the power off when you attempt to repair your hot water heater. Hot water heaters combine a perfect storm for injury and death. For one thing, the water could be extremely hot and you could get scalded. Not only that, but the metal could be electrified and you could get shocked. Before you attempt any maintenance, troubleshooting or repairs - simply turn off the unit. 2. If you are experiencing an issue with an unresponsive hot water heater, you may need to adjust the circuit breaker. Sometimes, hot water heaters can short out - either due to a surge or overuse - and the water can cool down. If you are experiencing this issue, all you have to do is flip the breaker back into the right position. This will bring the power back to the unit. You may have to wait a few hours for the heater to warm the water, but eventually your system will be back in order. 3. Adjust the temperature setting on the hot water heater. If you are having an issue with water that is too cold or water that is too hot, you will need to adjust the temperature on the hot water heater. Cold water can be uncomfortable, but it can also create a breeding ground for bacteria. Water that is too hot could cause scalding. 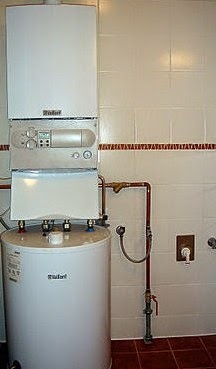 How hot should a water heater be? 120 degrees is the recommended temperature setting - maybe just a degree or two cooler if there are elderly people in the home. 4. Relight the pilot. On some gas powered hot water heaters, you will have an issue with a blown pilot light. If the pilot light is blown out, the heater will not be able to warm up. Most gas powered heaters spring into action when a spark catches the pilot and heats up the water, so it is important to make sure the pilot light is always on. 5. Insulate the hot water heater if you are experiencing an issue with showers getting gold toward the end. It can be quite frustrating to take a warm shower and then all of a sudden experience a sudden loss of warmth. This could be an issue with the fact that your heater isn't insulated. All you need to do is place a layer of insulation over the hot water heater. In the end, you want to increase the length of time it takes for the water to cool down.